Leonardo Log is a browser-based application consisting of two components: a Hub and a Log. Upon start-up, visitors have to construct the application: first, the Exit window (which closes Leonardo Log at any time), then the Log, and finally a node within the Hub. From the Hub, six animation sequences start, and they transmit text to the Log. This final “poem” can be sent as an email message from the Log and will consequently be available for further textual changes or simple archiving. The texts refer to six existential situations. They describe the following imaginary objects, which could inspire stability or instability in fluid or static moments: Fluidity Simulator, Mourning Carton, Pleasure Fountain, Quarrel Staff, Spurt Connection, and Think Container. 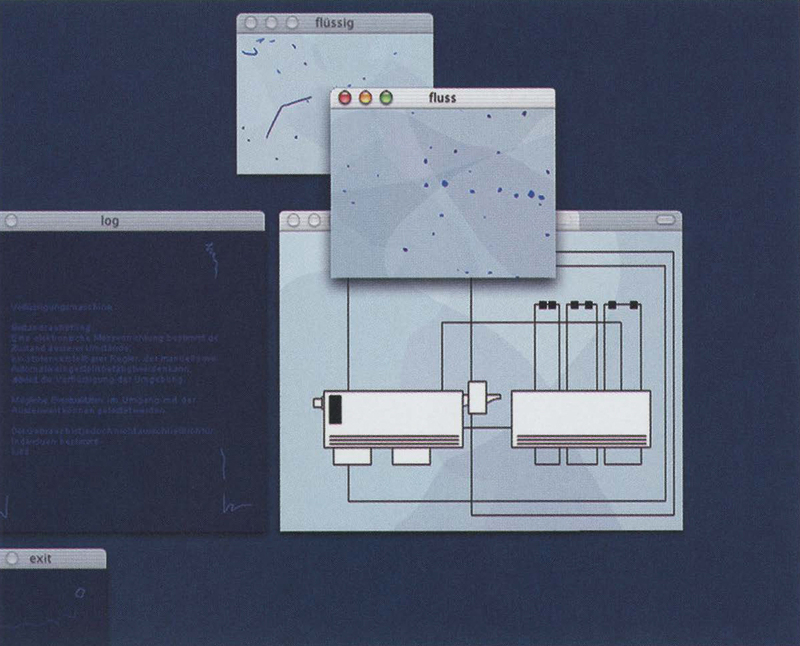 The animations contain abstract and figurative image sequences: associative drawings that occasionally move across several windows. Visitors have to discover links; the navigation is hidden in drawing elements. Each animation has a different structure. Some elements have to be moved, some must be clicked on, some are simply looked at. Users can send the resulting log book via email and use it as a further reference point amidst existential confusion. Leonardo Log was funded through an AHRB Research Fellowship. It is part of a series of works that began with Leonardo Log (Klanglandschaft), a sound work directed by Horst Konietzny that was performed and installed at iCamp Neues Theater, München,in 2002.